Last weekend we went to Centerville and had a very enjoyable visit with Louise and Mac. We also visited with Grandpa and Grandma. We both think it is remarkable the way Bonnie’s grandparents continue to be so well and active. We enjoyed a steamboat dinner and now Dad is trying to figure how he can make a steamboat. Knowing your Dad, you know he will get something produced in time. Today I attended a luncheon at the Union Building and a Layman’s meeting in Loeb’s Theatre. After the Layman’s meeting I came home, but saw Rev. McClure and a few other people in the lobby before leaving. This week Dad has been attending meetings and I have two more to attend (he has been going to dinner meetings) so we won’t get much done in the way of packing. We plan to go to Kentland Friday evening. He wants Dr. Logan to do some work on his teeth, and he plans to have office hours on Saturday. 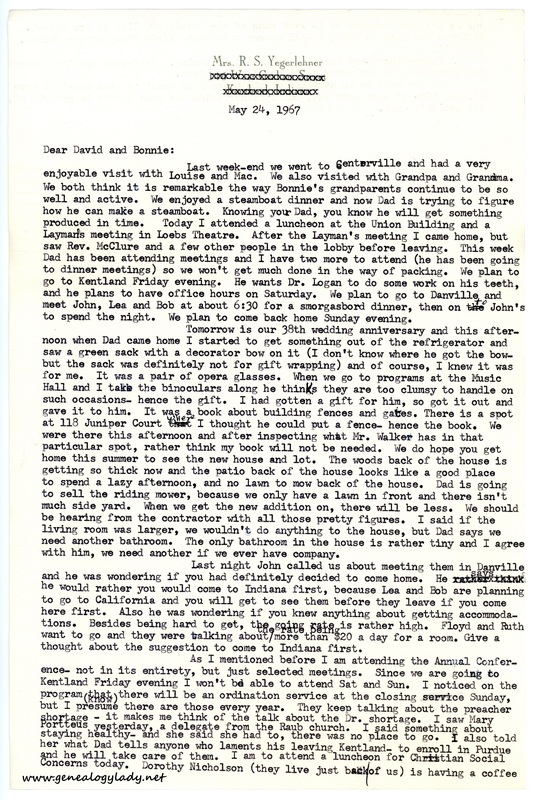 We plan to go to Danville and meet John, Lea and Bob at about 6:30 for a smorgasbord dinner, then on to John’s to spend the night. We plan to come back home Sunday evening. Tomorrow is our 38th wedding anniversary and this afternoon when Dad came home I started to get something out of the refrigerator and saw a green sack with a decorator bow on it (I don’t know where he got the bow – but the sack was definitely not for gift wrapping) and of course, I knew it was for me. It was a pair of opera glasses. When we go to programs at the Music Hall and I take the binoculars along he thinks they are too clumsy to handle on such occasions – hence the gift. I had gotten a gift for him, so got it out and gave it to him. It was a book about building fences and gates. There is a spot at 118 Juniper Court where I thought he could put a fence – hence the book. We were there this afternoon and after inspecting what Mr. Walker has in that particular spot, rather think my book will not be needed. We do hope you get home this summer to see the new house and lot. The woods back of the house is getting so thick now and the patio back of the house looks like a good place to spend a lazy afternoon, and no lawn to mow back of the house. Dad is going to sell the riding mower, because we only have a lawn in front and there isn’t much side yard. When we get the new addition on, there will be less. We should be hearing from the contractor with all those pretty figures. I said if the living room was larger, we wouldn’t do anything to the house, but Dad says we need another bathroom. The only bathroom in the house is rather tiny and I agree with him, we need another if we ever have company. Last night John called us about meeting them in Danville and he was wondering if you had definitely decided to come home. He says he would rather you would come to Indiana first, because Lea and Bob are planning to go to California and you will get to see them before they leave if you come here first. Also he was wondering if you knew anything about getting accommodations. Besides being hard to get, the going rate is rather high. Floyd and Ruth want to go and they were talking about the rate being more than $20 a day for a room. Give a thought about the suggestion to come to Indiana first. [page 2] for me this morning for me to meet some of the people who live on her street. If I can get away in time, I will attend a session – Bible Study by the Bishop, at 11:15. The weather here has finally turned to spring. Yesterday was the warmest day (according to the news) since one day last Sept.
Do you want me to save any of the books I am about to give away? I have not had time to sort them yet, but I rather think the ones I want to get rid of, you wouldn’t want. Let me know. 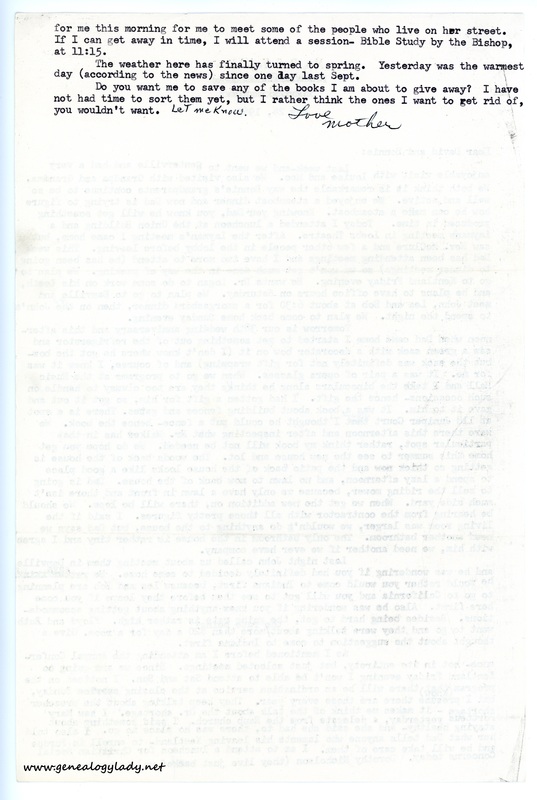 This entry was posted in Genealogy, Yegerlehner and tagged 1960s, Boston, Boston University School of Theology, David A. Yegerlehner, Dorothy Nicholson, Dr. Logan, Eugene O. McGraw, Floyd V. Yegerlehner, genealogy, Gladys R. (Foster) Yegerlehner, Ina (Kerschner) McGraw, Indiana, John F. Yegerlehner, Kentland, Lafayette, Lena "Lea" (Keith) Gieselman, Louise (Leonard) McGraw, Mary Portteus, Massachusetts, Oliver McGraw, Rev. McClure, Robert Gieselman, Roscoe S. Yegerlehner, Ruth (Salter) Yegerlehner on April 5, 2017 by Deborah Sweeney. “Tomorrow is our 38th wedding anniversary…” and they made it to the 60th!